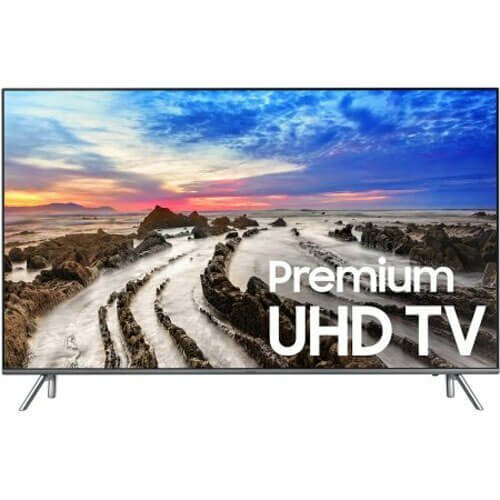 The Samsung MU8000 Ultra HDTV redefines the viewing experience that produces over a billion colors with 4K color drive extreme and a high dynamic range (HDR) picture. Our new Smart TV user-interface (UI), the new Smart remote Controller with voice navigation capability provides faster access to your favorite streaming content choices and more.An extreme step up in color with a billion more shades than regular UHD. Thanks to the dramatic range of Triple black, blacks are Now blacker-even in morning or afternoon glare-so you’ll never miss a detail in the dark. Enjoy smooth action without the blur. Motion Rate 240 brings sports and fast-moving content to life. Please note the differences between the MU8000 and the MU800D.